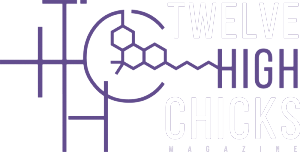 Together twelvehighchicks.com online and Twelve High Chicks Magazine in print are Twelve High Chicks, a pot publication that mixes weed-enjoyment with weed-activism, skepticism and feminism, serious cannabis issues and fun pot events, and other topics of interest to marijuana enthusiasts in Australia, Canada, the U.S., and around the world. The name isn’t just a clever use of “THC“, there really are twelve of them: each Chick represents an overarching theme that we feel is important in pot culture, from the wide field of Star’s “Art, Music, and Pot” to specific favourites in Moon’s “Stuff We Love.” They’re represented by designed creations of founder Ajia Mae Moon and illustrator Mark Ingram and also by women who are not only local models in “Vansterdam” but are also fans of smoking reefer and are advocates for pot legalization. Our regular and guest contributors include professional and aspiring writers, long-time activists and new consumers, medical patients and recreational smokers, parents, protesters, and just plain potheads. Welcome to Twelve High Chicks! Twelve High Chicks is the passion project and brainchild of Ajia Mae Moon. It’s one of the many initiatives of this busy mother of three: Ajia is also the founder of the Weed Woman comic, and co-founder of The Rabbit Hole — a new retail space in the former home of the Vancouver Seed Bank on East Hastings in Vancouver — and Rabbit Hole Retailers online. When she’s not busy working, Ajia is busy spending time with her kiddos and husband, lobbying against cannabis prohibition, being an active voting member of the NDP, planning her next trip to Australia, learning the guitar, and spending time with her employees and her “Moon” family. Jay is the managing editor for the website, the editor for Twelve High Chicks Magazine, and a writer for both. A poet with an affinity for haiku, leather, and activism, Jay also dives into other creative projects whenever possible. After an extended absence from pot, Jay enjoys, and is frequently amazed by, the quality of products available and the dedication of the people working for marijuana legalization. As an educated arguer with training in diverse fields from business management to existential philosophy, Jay knows that acknowledging all reasoned opinions strengthens communities, and that discussion makes cannabis activism stronger, not weaker. And no, Schmoeker is not their real last name.